On March 28, 1914, a story appeared in the Monitor, the newspaper and “official organ” of the San Francisco archdiocese, which alerted subscribers to the groundbreaking that month of the only Irish-themed concession, the Shamrock Isle, at the upcoming Panama Pacific International Exposition. “For the first time in the history of this county,” the editors exclaimed, “the real Ireland is to be properly represented.” This was a big commitment: there had already been three Irish Villages at two previous world’s fairs that promised the same thing. The real Ireland, at that moment, was skirmishing with itself over labor issues and against England in pursuit of independence. It wasn’t clear in Ireland what the “real” Ireland was—colonial dependent or contender for small nation status—and if it wasn’t clear there, how could the exposition organizers be so sure of themselves? The Shamrock Isle, which was located on the Joy Zone, the 65-acre amusement section of the exposition, stood apart from the main exposition grounds by virtue of distance as well as programming. 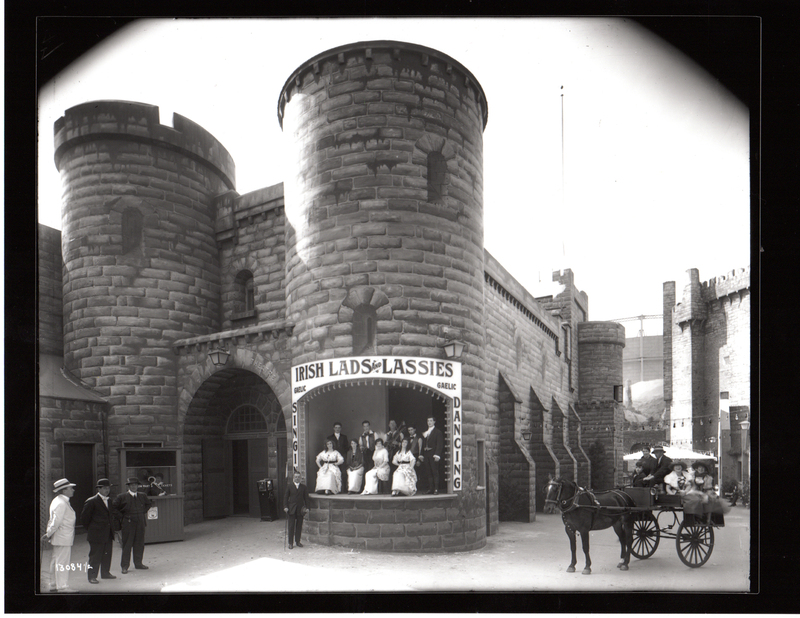 Where the baseball diamond in the Moscone Recreation Center now stands, a replica of St. Laurence Gate, the famed barbican gate which failed to prevent Cromwell’s soldiers from massacring the villagers of Drogheda, welcomed visitors into the concession. Directly across from the Irish Village stood the Chinese Village. This placement was both ironic and fitting, given the historical antagonism of the Irish working class and their union leaders towards the Chinese, who were their unacknowledged confreres in the building and development of San Francisco. “There are many dignified reasons for having an amusement district,” wrote official PPIE historian Frank Morton Todd, somewhat defensively. One reason was the “exhibition of strange people and customs.” The other reason was simple. “People want to have fun.” Perhaps he was saying what the exposition board could not. Underlying the beauty of the exposition, with its acres of Beaux Arts palaces, romantic courtyards, and flower-lined avenues, was a tone of hectoring insistence on public education, self-improvement, and better living through unrestrained consumerism. An index from June 22, 1915, lists the day’s programs, forty-five separate events, with lectures like “Dogs: Their Points and Purpose” and “Care and Treatment of the Insane.” After gaping at such novelties as the Large Electric Clock in the Palace of Manufacturers or being serenaded by the Anvil Choir (this was five “automatic blacksmiths” who hammered out the Westminster Chimes on their anvils), visitors were encouraged to bend their steps towards the Joy Zone and the long avenue of theatres, restaurants, rides, and exhibits. The exposition was engrossing and memorable, certainly. But it may have been a bit exhausting as well. After the spectacle of the eleven palaces and the relentless whirl of activity throughout the main grounds, feeling joy might have been a stretch. I have a souvenir photo of my great-grandfather, San Francisco attorney James H. Creely, and his two daughters. James looks wearily dazed. Perhaps he heard too many renditions of the Westminster Chimes. To read the essay in full, go to Found SF.